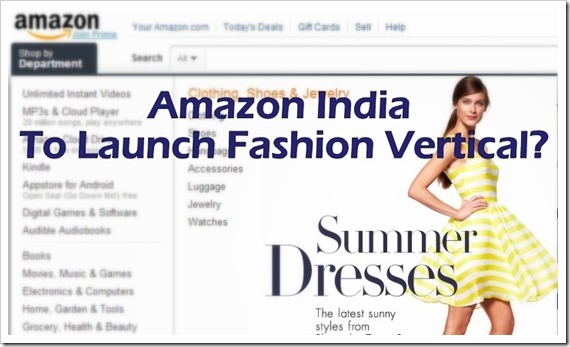 Amazon’s India launch has been much talked about over past few weeks. The Indian marketplace started off with 2 verticals – Books and Movies. In couple of weeks since launch, they expanded their offering to Mobiles, Photography and Electronic Gadgets. Guess, what’s next in line? It may turn out to be the fashion vertical! Atleast the Job posting that Amazon has put up on Linkedin earlier this month for their Bengaluru office points to that. The job description put up by Amazon for “Manager, India Studios” clearly points to the fact that Amazon may sometime in future may launch Fashion vertical. Here are some of the excerpts from listing. The Manager, India Studios position will play a critical leadership role in the launch of e-commerce operations for fashion and other product categories in India. It will be based in Bangalore and reports to the Director, Imaging Operations. There is something quite interesting about the job description – From what I can see, Amazon may be launching the fashion vertical internally on their own and not purely through 3rd party network of sellers. Amazon is after all a marketplace and apart from digital items (ebooks, apps) and books, most of the products currently listed on Amazon.in are from external sellers. In my personal opinion, we will increasingly see more products directly being sold and fulfilled by Amazon India directly, exactly the way it is in the US.